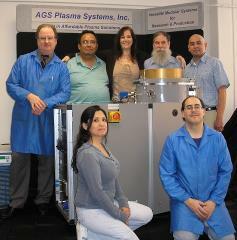 AGS Plasma Systems, Inc. is the preeminent manufacturer of affordable vacuum plasma systems used for etching and deposition of patterns needed in the microelectronics and optoelectronics industries. The company was started as A.G.Services in 1991 to provide service, quality spare and replacement parts to owners of Semi-Group/IPE vacuum plasma systems throughout the world. Since then, we have also designed and installed a variety of product enhancements. In 1994, AGS introduced the new System 1700-Plasma™ through a joint venture. In 1995, the APC-2000™ line of Windows® plasma system controllers, in 1997, the PLEESE™ suite of plasma analyzers, in 1998 the System 1700-MCP™ High Density Plasma tool was developed, and in 1999 a cluster tool version was added to the 1700 series. In 1999 the joint venture was dissolved and AGS opened an independent manufacturing center. In 2000 A.G.Services incorporated and the name was changed to AGS Plasma Systems, Inc. to reflect the new emphasis on providing advanced plasma technology solutions to its customers. In 2001, the MPS-150™ was introduced to meet the unique demands of 2-6" compound semiconductor manufacturing. 2003 heralded the introduction of the Visor-100 bench top plasma decapping system using downstream technology. The new MPS-200/300 Series platform was released in 2005 and is a high performance plasma tool used in a variety of demanding applications. The MPS is also available as an OEM module. AGS added an international sales team in 2004 with offices and representatives located throughout the world. In 2019, AGS Plasma is celebrating our 28th year of steadily increasing sales and success.